US, 1960, 83 minutes, Colour. Gerald Mohr, Naura Hayden, Les Tremayne. A B budget science fiction, coming soon after the first satellite being put into space. 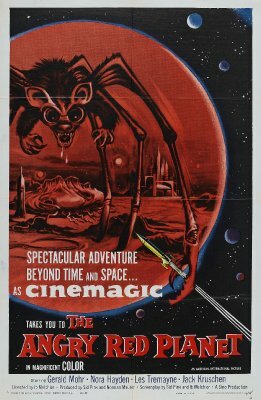 The attitude towards space exploration as presented on screen is very much that of the more "primitive" science fiction films of the fifties. They may seem to be pioneering efforts in view of the success of science fiction films and big budgets in the seventies. The focus is on the planet Mars and a foreboding attitude towards the exploration of space is presented. The special effects are minimal and the Martian landscapes excessively artificial. However, an interesting small example of early space films. 1. Entertaining and interesting science fiction? Its value as presenting approaches to science fiction on the screen in the fifties? 2. The B Budget, the conventions of space films and space exploration the explorers and their personalities, clashes? The craft and the scientific jargon? The journey in space, the hazards? Mars and the overtones of The Day of the Triffids? The film drawing on expected conventions? 3. Colour photography, special effects, the score? 4. The plausibility of the plot - for 1960, for later decades? Sufficient for the plot, for the purposes of the genre? Airs of realism, with the jargon, the newsreels etc.? Contrived with the adventures on the planet Mars? 5. The structure of the film: the mysterious return of the space ship, the worry about the survival of the team, the heroine and her story and the jogging of her memory, the hero and his injury? The response of the Earth Control? The various phases of the heroine remembering her story and the culmination on Mars and the return? 6. How plausible were the characters? Conventional American attitudes, the ordinariness of the dialogue, commonplace interaction? Sufficient for the movement of this film? 7. Life on the space ship, the interaction of the crew, the romantic sub-plot? Heroism in exploration, coping with crises, death? 8. The appearance of Mars, the sudden scares, the advanced civilisation and its primitive appearance, the vegetation and its murderous effect? warning to Earth not to explore? The attitude that Earth was very late developing civilisation? 10. How satisfying is this kind of popular entertainment - matinee material, in comparison with the more sophisticated product of the seventies? The basic presuppositions in the audience about space, inhabited planets, the value of exploration, dangers, contrasting civilisations?